Jot 'Em Down, Delta County, TX. 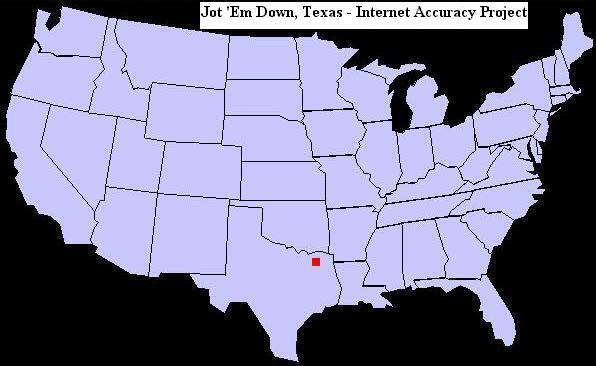 Jot 'Em Down, Texas is located in the northeast corner of the state, in extreme western Delta County, near the Hunt county line and the small town of Pecan Gap. Jot 'Em Down received its name from a local business around which sprang the tiny community. That business was named after a fictional store on the popular radio program, Lum and Abner. Jot 'Em Down was the central setting for the classic hillbilly radio show, which ran from 1932 to 1954. Thousands of episodes of the rural radio comedy were produced during its long run. Nearby cities and towns include, Pecan Gap, Ben Franklin, Paris, Commerce, Klondike, and Dallas (located to the southwest). Time Zone: Jot 'Em Down, Texas is in the Central Time Zone. Camping, fishing, mountain biking, hiking, swimming and boating are just a few of the many outdoor recreational opportunities in the region. Raccoon, beaver, bobcat, opossum, fox, deer, and the armadillo are amongst the varied wildlife found in the hills, state parks and wilderness areas of northeast Texas.